Cameron Bancroft helped guide the Perth Scorchers to their second straight victory as they once again chased down an opponents total with ease. A masterful innings from Bancroft saw the home side seal the seven-wicket win with the opener finishing unbeaten on 87. Unfortunately the game was earlier thrown into disarray when Bancroft's opening partner Michael Klinger was sent packing in controversial circumstances. 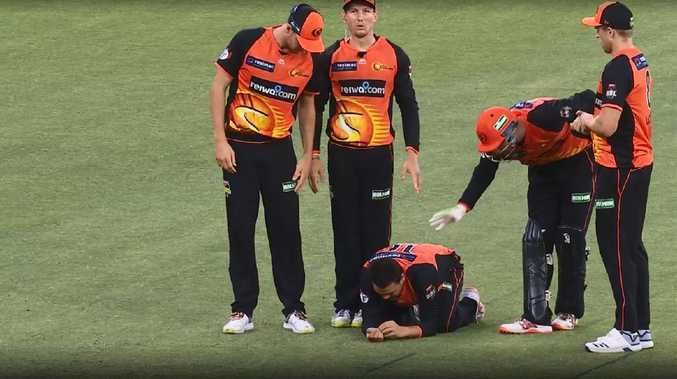 Klinger was caught in the deep by a diving Steve O'Keefe with the catch being sent upstairs to be reviewed. Ultimately it was determined to indeed be a legitimate catch, but that wasn't the reason for the controversy. Somehow the umpires missed that fact that Sydney Sixers bowler Ben Dwarshuis had already bowled the six balls from his over. Meaning Klinger was sent on his way from ball number seven. Somehow both field umpires, the fourth umpire, a match referee and even a counter on the scoreboard couldn't pick up the monumental error. An official update from Cricket Australia was read out on Fox Sports' coverage of the game by Kath Loughnan. "It appears there was a miscount of balls in the over and a seventh ball was allowed by umpires," the statement read. 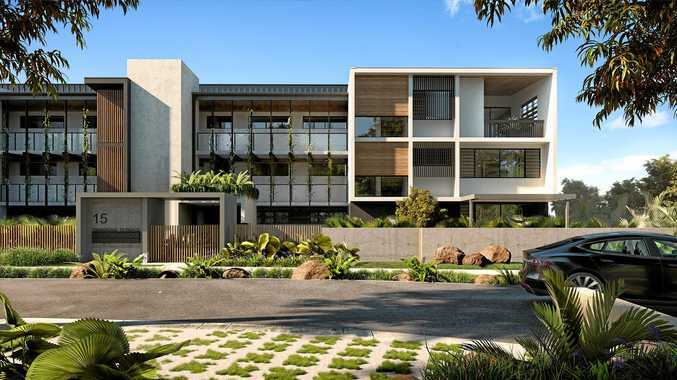 "As the ball was bowled it is deemed live and consequently the decision stands. The incident will be followed up by Cricket Australia's general match review process and feedback will of course be taken on board." The stuff up didn't end up costing the Scorchers in the end, but fans and commentators were left in disbelief the error wasn't picked up. Taking a wicket is joyous occasion for a bowler and brings about some brilliant celebrations, unfortunately for Usman Qadir things didn't go to plan. Bowling to Sixers opener Daniel Hughes, Qadir drew the loose shot and he tracked the delivery back over his head to take the marvellous catch. But his celebration quickly turned sour as he sat on the turf inspecting his bloody arm and sadly he's only got himself to blame. After reeling in the catch Qadir threw his right arm back a little too heavily in celebration and his hand/wrist slammed into the spikes on the bottom of his shoe. Thankfully the inadvertent injury didn't cause anything severe and Qadir remained on the field. The Perth Scorchers stadium hasn't become a place for opposing teams to fear this season and the Sydney Sixers have followed the trend. Batting first at Optus Stadium, the Sixers have made a more than solid start by pushing the Scorchers' attack all around the ground for 40 runs from the first five overs. Glued to the bottom of the Big Bash ladder and somehow things have gone from bad to worse for the Scorchers. 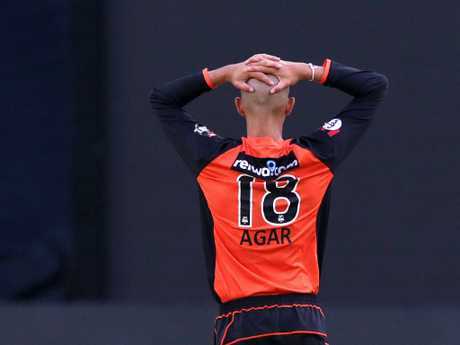 Ahead of a must win clash against the Sydney Sixers, the home side have lost star all-rounder Ashton Agar to injury. Agar will watch on from the sidelines after picking up an ankle injury and has been replaced by Cameron Green. Through seven games Agar has taken five wickets and scored 58 runs, but the nightmare for the Scorchers continues to get worse. The Scorchers season has been tough to watch. Thankfully his replacement brings in some sublime form after notching an unbeaten 119 in his last outing with the bat. The team expect Agar to be available for Friday's clash against the Melbourne Stars, but are in desperate need of wins. After being on the brink of being dropped earlier in the competition, opener Michael Klinger retains his place atop the order.